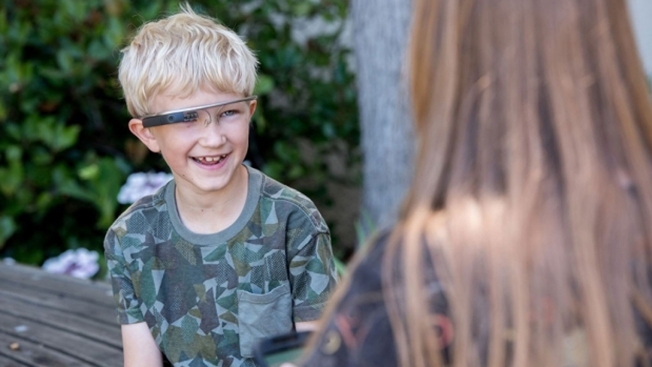 Alex, 9, wears Google Glass while talking with his mother Donji Cullenbine in this undated handout photo. He was part of a study that used the devices to help kids with autism recognize facial expressions. Most children with autism who wore Google Glasses equipped with facial expression-interpreting software made improvements in holding eye contact with their families, according to a study published Thursday. The lead author of the Stanford University School of Medicine study, Dennis Wall, told NBC News that the Superpower Glass trial — the first outside of a laboratory — used technology that turns emotion reading into a game that's "an opportunity for fun and engagement." Donji Cullenbine said her 9-year-old son Alex didn't make much progress through therapy. But when he took part in the trial, he was suddenly making frequent eye contact. "It was thrilling," she said. "I tried to incentivize him to look at me for so many years, but had no movement. Then in two weeks, it was like a flip switched. He said, 'Mommy, I can read minds.'"